Other vices may sometimes bring people together: you may find good fellowship and jokes and friendliness among drunken people or unchaste people. But Pride always means enmity—it is enmity. And not only enmity between man and man, but enmity to God. In God you come up against something which is in every respect immeasurably superior to yourself. Unless you know God as that—and, therefore, know yourself as nothing in comparison— you do not know God at all. As long as you are proud you cannot know God. A proud man is always looking down on things and people: and, of course, as long as you are looking down, you cannot see something that is above you. That raises a terrible question. How is it that people who are quite obviously eaten up with Pride can say they believe in God and appear to themselves very religious? I am afraid it means they are worshipping an imaginary God. They theoretically admit themselves to be nothing in the presence of this phantom God, but are really all the time imagining how He approves of them and thinks them far better than ordinary people: that is, they pay a pennyworth of imaginary humility to Him and get out of it a pound’s worth of Pride towards their fellow-men. I suppose it was of those people Christ was thinking when He said that some would preach about Him and cast out devils in His name, only to be told at the end of the world that He had never known them. And any of us may at any moment be in this death-trap. Luckily, we have a test. Whenever we find that our religious life is making us feel that we are good—above all, that we are better than someone else—I think we may be sure that we are being acted on, not by God, but by the devil. The real test of being in the presence of God is that you either forget about yourself altogether or see yourself as a small, dirty object. It is better to forget about yourself altogether. It is a terrible thing that the worst of all the vices can smuggle itself into the very centre of our religious life. But you can see why. The other, and less bad, vices come from the devil working on us through our animal nature. But this does not come through our animal nature at all. It comes direct from Hell. It is purely spiritual: consequently it is far more subtle and deadly. Lewis concludes by describing what the humble person looks like. And he lays out what the first step would be for anyone seeking humility. 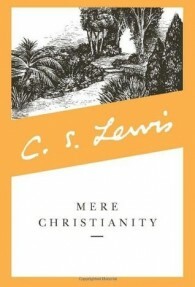 C. S. Lewis’ Mere Christianity is unrivaled in the area of Christian apologetics. It is without question the most popular and most useful apologetics book in the modern world. It is available in numerous paper and hardback editions. It is also available online in pdf, but every Christian should own their own print copy. For the “The Great Sin” online, go here and scroll down to page 61. Oh my. Such a salient post for me today. I won’t go into details, but suffice it to say that this most capital of sins is always at the forefront of my natural behavior. In case it isn’t said often enough, thank you for this blog. I have found it to be a regular source of encouragement and edification. Keep up the great work!